You’ve got to like Chris Christie of New Jersey, the rebel Republican Governor who refuses to play by the Republican Party rules. In fact, you have to admire any politician these days who refuses to play by the rules of their party, though you do have to wonder about their political future. The name of the game these days is money and independent politicians have to garner a huge popular following to even keep close to those who are funded by the Big Spenders. “These folks are consistently among those who need help the most — men and women who have suffered trauma in their lives, live with mental illness, rely on New Jersey’s emergency rooms for primary health care, or those citizens who lack insurance or access to treatment in other ways,” Christie said. “These folks” are the poor who are in desperate need of health care and can’t afford it. Christie seems to be placing their needs above his own political future. Or so it would seem. If he is an astute politician, as I suppose he is, he may see the end of the stranglehold the ultra-conservative, true believing, Tea Party types have on the Republican Party and may be placing himself at the head of a group he hopes to draw from the middle ranks of the Party. It would make sense. After the recent election, the Republican Party is in shambles, divided into several unequal parts and a strong leader who emerges from the middle might well pull the party faithful with him and begin to build a new consensus. Let’s hope so for the future of our Democratic system. We need two healthy parties that will work to accommodate one another and even agree to compromise from time to time. As things now stand the two Parties are drawn up into warring camps throwing stones and accusations at one another across an ever-widening chasm. I speculate, of course. 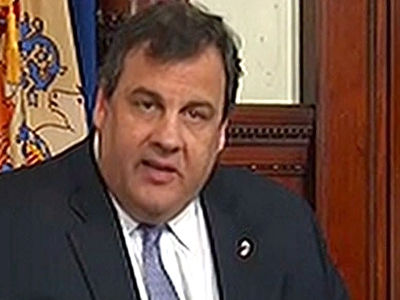 I have no idea what Christie’s plan is. But I do admire him for giving the finger to the Powers-That-Be in the Republican Party and for doing the right thing — regardless of what his reasons might happen to be.